These are our wildcrafted Washington State Grade A+ Amanita muscaria mushrooms, dry-aged for a minimum of 5 years or more. These brilliantly-colored caps are truly the pride of our shop. 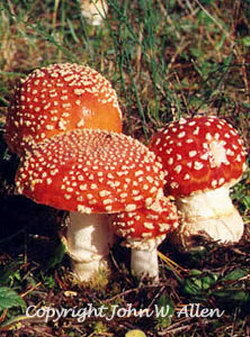 We source Amanita muscaria from around the world, but never have we known more perfectly preserved specimens than these. We've come to know the person who harvests these personally, and he is a true professional in every sense of the word. Not only does he find the most amazing specimens we've ever seen, he's a true expert at shade-drying these Amanitas, to perfectly preserve the mushroom as close to their natural state as possible. These may be pricier than other Amanitas we carry, but the quality of these specimens speak clearly for themselves. In laboratory tests, these consistenly score at the top end of what a perfectly preserved Amanita should look like, both internally and externally. We stand behind these 100%, and only have a small amount to offer each year. These dried caps are sold for their historical and ethnobotanical interest only and are not for human consumption; they are listed as a poison by the FDA. These are our wildcrafted Washington State Grade A+ Amanita muscaria mushrooms. These brilliantly-colored amanita caps are truly the pride of our shop. We source Amanita muscaria from around the world, but never have we known more perfectly preserved specimens than the ones from Washington State. We've come to know the person who harvests these personally, and he is a true professional in every sense of the word. Not only does he find the most amazing specimens we've ever seen, he's a true expert at shade-drying these Amanitas, to perfectly preserve the mushroom as close to their natural state as possible. These may be pricier than other Amanitas we carry, but the quality of these specimens speak clearly for themselves. In laboratory tests, these consistently score at the top end of what a perfectly preserved Washington State Amanita should look like, both internally and externally. We stand behind these 100%, and only have a small amount to offer each year, although this past year was a bumper harvest, so the prices have dropped accordingly. There's a wealth of information on the internet about Amanita muscaria, and one of the places to look for anything related to this mushroom of such Shamanic and folklore surrounding this fungus is The Amanita Shop. NOTE: These dried caps are sold for their historical and ethnobotanical interest only and are not for human consumption; they are listed as a poison by the FDA.